If you're feeling nostalgic for summer but you don't necessarily miss the extreme heat, check out Tucson. Fall and winter is arguably one of the most enjoyable times to visit Arizona, specifically the Sonoran Desert. Either plan to explore the multiple mountain ranges and parks surrounding the city, or explore the city's adobe row houses, restored mansions and many vintage shops, nightclubs and restaurants spread throughout the city. Fortunately, there are plenty of relatively inexpensive flights between San Jose and Tucson on travel site Skyscanner. Here's a list of flights, hotels, restaurants and local attractions in Tucson to get you started. The cheapest flights between San Jose and Tucson are if you leave on Jan. 23 and return from Arizona on Jan. 26. Alaska Airlines currently has tickets for $135, roundtrip. Alaska Airlines also has tickets at that price point in February. If you fly out of San Jose on Feb. 2 and return from Tucson on Feb. 6, Alaska Airlines can get you there and back for $135 roundtrip. 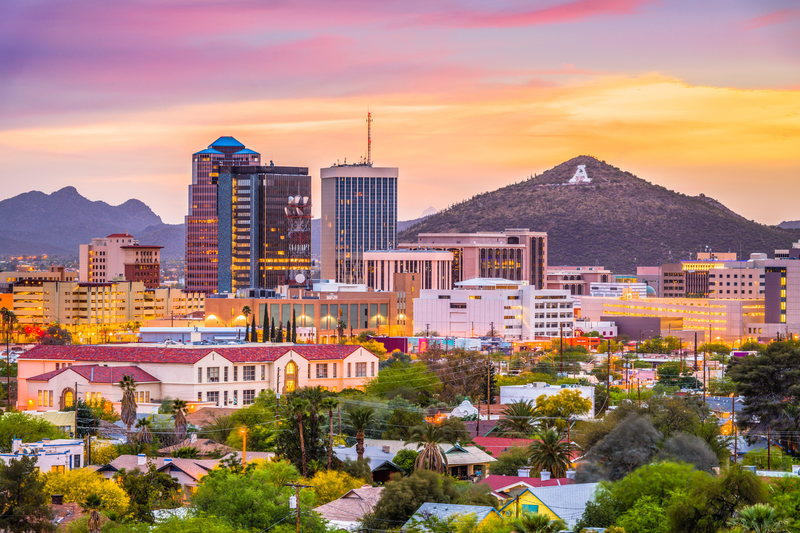 To plan your accommodations, here are some of Tucson's top-rated hotels, that we selected from Skyscanner's listings based on price and customer satisfaction. If you're looking to splurge on top quality, consider The JW Marriott Tucson Starr Pass Resort & Spa. The hotel has a 4.8-star rating on Skyscanner, and rooms are currently available for $199. Dining options at JW Marriott Starr Pass Resort and Spa include six bars and restaurants. Recreational amenities include Starr Pass Golf Club with 27 holes of championship golf plus on-site pools, a waterslide, lazy river and the Hashani Spa. There's also the 4.3-star rated The Westin La Paloma Resort and Spa. Rooms are currently set at $159/night. This spa resort is located in the mountains. The Ventana Canyon Golf and Racquet Club and the University of Arizona are local points of interest. Another area attraction is Tohono Chul Park. A third option is The Omni Tucson National Resort, which has rooms for $138/night. This Tucson spa hotel is located in the desert, near Omni Tucson National Golf Resort. Another nearby attraction is Tohono Chul Park. If you're looking for a popular spot to grab a bite, Tucson has plenty of excellent eateries to choose from. Here are a few from Skyscanner's listings to help you get started. If you're looking for a local favorite, head to Cafe Poca Cosa, which has an average of 4.8 stars out of 49 reviews on Skyscanner. "I know of no other restaurant that makes Mexican food so healthy and delicious," wrote visitor Jeanine. Don't forget the essentials: where to get your coffee and dessert fix. For a popular option, check out Village Bakehouse, with five stars from seven reviews. Serving the region for more than a decade, Village Bakehouse is located in beautiful Oro Valley and features both inside and outdoor patio seating. Also worth considering is Lerua's Fine Mexican Food, which has catered to families all over Tucson since its inception in 1922. Tucson is also full of sites to visit and explore. Here are a couple of popular attractions to round out your trip, again from Skyscanner's listings. First up is Sabino Canyon Recreation Area. In an area of Arizona that is replete with beautiful natural features and tourist attractions, Sabino Canyon holds the dual distinction of being perhaps the most beautiful and certainly the most popular site for miles around. The chasm in the Santa Catalina Mountains is a destination for both a pleasant sightseeing trip or a strenuous hike. You can also take advantage of one of the narrated tram tours that guides you among the cacti, palo verde trees, rocky outcroppings, steep valley walls and gurgling brooks. "In the spring, expect to see waterfalls and pools. One of Tucson's truly beautiful areas," wrote visitor June. Seven Falls is another popular destination. "Take the lower Sabino Canyon tram to the Seven Falls trailhead and let the fun begin," wrote visitor Bill. "Take plenty of water and ample snacks so when you arrive at the Seven Falls you can relax, recharge and refuel."